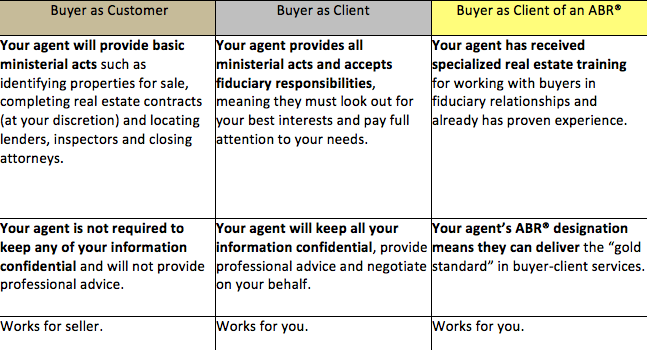 WHEN BUYING A HOME, WHICH LEVEL OF SERVICE DO YOU WANT? When it’s time to buy a home, you have choices—not only in the type of property you want to purchase but also in the real estate professional you select to assist with your transaction. Your relationship with an agent can take many forms and it’s important to understand the differences in the services you will receive. An Accredited Buyer’s Representative (ABR®) can discuss these differences in greater detail. Ask them to answer any questions you have before you decide how you’d like to proceed in your home search. You’ll be glad you did!